Student recognizes the need to accurately record information about a source as a means of establishing credibility. Student recognizes that different kinds of authority produce different kinds of information. Student seeks out the author’s qualifications as part of the investigation of a source’s usefulness. Student discerns reasons for using or not using information to complete an information task. Authority is generally defined as the level of influence an information source has in its field. The ACRL further says that Authority is Constructed and Contextual. Contextual means that there are different fields of knowledge and that expertise is respective to a field. For instance, both a PhD and an MD may be authoritative sources, but only in their respective fields. Obviously different kinds of scholars belong to different kinds of fields, but even within a single field there may be different levels and kinds of authority. This is where the constructed part comes in. Different disciplines have different ways of building and maintaining authority. Academics publish and present at conferences, doctors treat illnesses successfully (or unsuccessfully! ), scientists perform experiments and have them peer reviewed by other experts in the field. But some conferences are more prestigious than others, just as some journals are more rigorous in their peer review. It pays to be aware of each discipline’s respective hierarchy. In the chaotic shouting match of public discourse, care should be taken to acknowledge different kinds of authority and how those authorities came to be. A discussion of global warming may include scientists, politicians, economists, military leaders, city planners, and many others. Each voice may bring a different kind of expertise to the discussion, but each is just as likely to present the issue solely within the framework provided by his or her own discipline. Boy with Stars in His Eyes. Considering how all these voices fit together to form one body of knowledge and properly placing each in its proper context is imperative. For example, economists will be the best source for determining how global warming may affect economic output, but they are not the best source for determining if forecasting models are accurate. Climate scientists are the best source for predicting how the climate system will behave in the future under certain conditions, but military leaders might be the best sources for determining what kinds of threats social unrest will pose in regions affected by climate change. Each area of expertise may deserve a seat at the table, but determining how much authority each should have is determined both by context and by how that authority was created within its discipline. In short, a climatologist knows more about climate change than a meteorologist, and among climatologists, some have proven themselves more reliable than others. The different kinds of authority–whether scientific, academic, political, moral, or popular–require that researchers be aware of the context and sphere of expertise within which each operates. Moreover, it should surprise no one that there are problems in virtually all information production systems that should be understood by researchers. As pointed out elsewhere on this site, government, free-market, and academic sources are all sometimes subject to a variety of issues. The overt partisanship of political figures most often biases their opinions and policies; the moral authority of religious leaders may conflict with new technology or social change; the peer review system of academic journals has been repeatedly gamed by unscrupulous professors caught in the cutthroat world of publish or perish; and celebrities may do a few internet searches and use their places of prominence to encourage dangerous diets and medical advice. Rarely are any of these occurrences checked by news media, which Janine R. Wedel (2009) suggested is compromised by a lack of authority and expertise. In her Shadow Elite, she expressed concern that people prominent in public discourse, are often inexpert and merely presenting themselves as authorities (4). By accepting such performances, news media are allowing objectivity, expertise, and accuracy to be devalued (3-4). The most credible, most authoritative information available to researchers is most often found in peer-reviewed journals or is otherwise produced via the scientific method, which is the formal process of scientists asking questions, doing background research, constructing hypotheses, testing those hypotheses in controlled experiments, analyzing the data, drawing conclusions about it, and then sharing it with other experts in the field so that they can test the results themselves. But as noted above and elsewhere on this site, even this information should be checked against other information in the field with an eye on the refrain that extraordinary claims require extraordinary evidence. Still, that does not mean to ignore experts. With the advent of the Internet, anyone can go online and contradict the experts. It doesn’t make him right, even if he sounds persuasive. 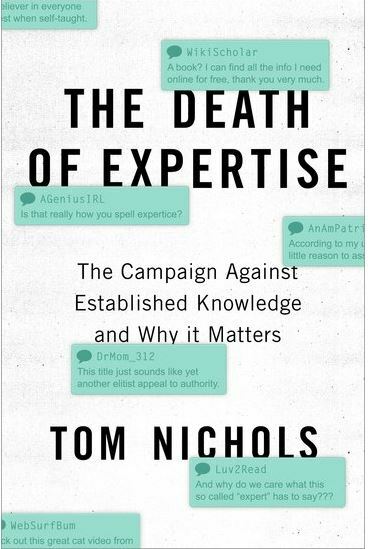 As Tom Nichols (2017) lamented in The Death of Expertise, “Maybe it’s not that people are any dumber or any less willing to listen to experts than they were a hundred years ago; it’s just that we can hear them all now” (16). There are many different kinds of authority. Scientists, academics, political leaders, preachers, economists, lawyers, and cab drivers can all give you useful information. But a cab driver probably can’t tell you what to do about gall bladder pain, just as a doctor doesn’t necessarily know about rush hour traffic patterns. A researcher needs to know whose authority takes precedence in the context of the research task. Spend a couple of minutes talking with your group about the different kinds of authority cited in your sources’ treatment of global warming. Are the authorities consulted scientific, religious, economic, governmental, academic, or popular? Which is more convincing and why? What kind of authority is the author? What qualifications does the author have to talk authoritatively about global warming? Would you use this article for your research project? Why or why not?